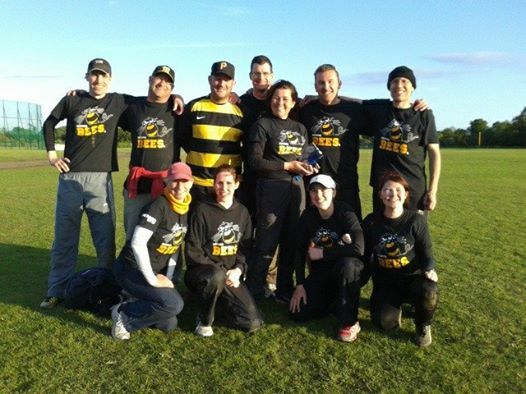 Five Bristol teams contested the first big tournament of the 2014 season this past weekend; Diamond 1 at Farnham Park. The bad weather forecast didn’t quite meet our fears, that is until the foolish application of sun cream around noon brought an almost instant response. Torrents repeatedly dampened spirits throughout the rest of Saturday. The weather mostly relented for Sunday, though the wind kept pitchers and outfielders on their toes. Playing in C grade were Lucky Strikes, Bristol Monkeys and Creamers, who managed to avoid each other in the group stages. Early on day two, Monkeys and Creamers battled both each other and their respective hangovers, to finish with a 12-3 win for Monkeys. Strikes narrowly missed out on a place in the spoon final, finishing 3rd. Monkeys ended up 4th in the plate while Creamers made it to the plate final, coming off second best. Over in B grade, newly formed Diablos (mostly Phoenix) having beaten 2013 series winners Raiders Gold, finished 5th in the plate. Bristol Bees, despite losing Lexi Keegan to a ball/face disagreement, managed to pick up their second Diamond title in a row. Go Bees! 2017 season is here… who’ll end up with the silverware?